When a homeowner believes they may have a foundation problem in their home, it needs to be dealt with as soon as possible. The longer a person waits, the more the damage can increase, and the cost of repairs becomes higher. If this problem is ignored, the cost could be in the thousands of dollars. When water accumulates under a home’s foundation there can be damage. A report was prepared for the U.S. Army Corps of Engineers explaining how foundation leaks beneath slabs could cause ground displacement to occur. This can cause the slab underneath a home to crack. It may also lead to cracks in the floors and tiles of a house. It could cause an increase in a homeowner’s water bill. Sanitary issues could develop involving moisture such as mildew and mold. What Can Cause A Foundation Leak? There are a number of events and conditions that can cause foundation plumbing leaks. Some homes have piping that is in bad condition. These pipes may have poorly assembled fittings. It could also be the result of ground moment caused by expanding and contracting soils as a result of weather conditions. In some cases, roots have been the cause of a foundation leak. Commercial waste pipe cleaners have also eaten through pipes and caused such leaks. If people see a damp spot on their floor that doesn’t go away, it could be a leak. In this situation, the damp spot can eventually grow into a puddle that won’t go away. When changes in the color or look of a home’s walls occur, this could be the sign of a foundation problem. This change could happen in the trim or drywall. These changes could be discoloration, buckling, dampness or staining. It’s important for homeowners to realize most leaks start small and become worse over time. 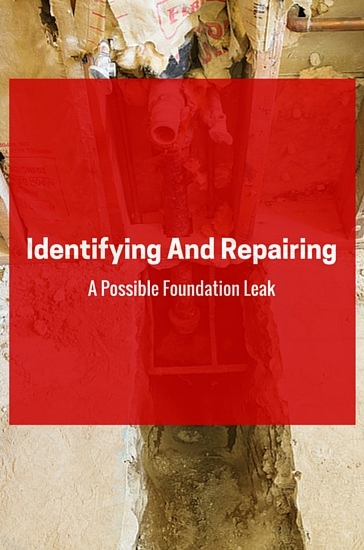 When a foundation plumbing issue is detected, it will need to be repaired. There are situations where a person’s homeowner’s insurance will pay for the repairs. It will benefit the homeowner to contact their insurance company and see if foundation leak repairs are covered by their homeowner’s policy. Items related to gaining access to the leak as well as doing the repair will often be covered by insurance. This can also include situations where a wall needs to be cut open and more. Homeowners want to know how long it will take to repair their home’s foundation. A trained and experienced plumber will be able to identify a slab leak and determine its location pretty quickly. The next step is for the plumber to discuss the options available for a homeowner’s situation. A customized quote detailing the options will be provided. Once that is done, the repair may be able to be completed in as little as one day, depending on the nature of the problem. It’s possible a plumber will use electronic listening equipment as well as cameras and electronic line tracing equipment. 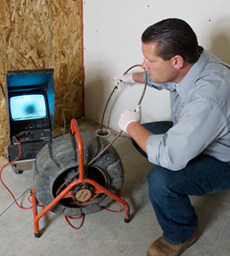 Any equipment necessary to detect the foundation leak problem and provide a solution will be used. In some situations, the homeowner will know the cause of the water leak. The plumber can confirm this. When a homeowner in Texas has foundation problems, our trained and experienced plumbing professionals can help. We are leaders in the field of underground plumbing diagnosis and repair and can provide repairs so the need for water or sewer line replacement can be avoided. At Accurate Leak and Line we have specialists trained in testing for leaks in slabs. We use the most effective methods and equipment from hydrostatic pressure testing to video camera inspections and more. Whether you are located in Austin, San Antonio, or the Dallas/Fort Worth area Accurate Leak and Line can provide you with the solution you need in resolving any under slab issues you may have. Contact us today to have one of our professionals assess your situation.